This is a Chinese name; the family name is Sy (Shi). Henry Tan Chi Sieng Sy Sr. (Chinese: 施至成; pinyin: Shī Zhìchéng; Pe̍h-ōe-jī: Si Chì-sêng; October 15, 1924 – January 19, 2019) was a Chinese-Filipino business magnate and philanthropist known for his involvement in the Philippines' retail industry. For eleven straight years until his death, Sy was named by Forbes as the richest person in the Philippines. Upon his death on January 19, 2019, his estimated net worth amounted to US$19 billion, making him the 53rd-richest person in the world. 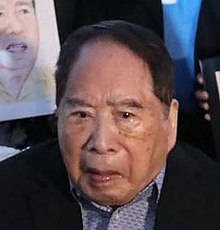 Henry Sy (also known as Shi Zhicheng) was born in Amoy in Fukien Province in the Republic of China (now Xiamen, Fujian Province, China), on October 15, 1924. At age 12, he and his family moved to the Philippines, where his father set up a shop that sold various household items. At his father's store, Sy helped his father sell rice, sardines and other merchandise. Following World War II, the store got obliterated along with the rest of Manila. His family decided to return to China, but Sy stayed in the Philippines where he completed his secondary education at an institution now known as the Chiang Kai Shek College and earned his Associate of Arts degree in commercial studies at Far Eastern University in 1950. While studying in school, he also learned how to speak in English and Filipino. In his twenties, Henry Sy became a store manager working for an American business involved in the local shoe industry in the Philippines; he opened his first sole-proprietorship store in Quiapo, Manila in 1948. He opened at least three shoe stores in the Carriedo area which was then known for its heavy pedestrian traffic. His decision to sell shoes was due to the losses his family experienced in World War II thinking that everyone would need shoes following the aftermath of the war. He sold surplus G.I. boots and saved finances before he established ShoeMart in 1958, his own small shoe store in Quiapo, that marked the beginning of SM Prime. He later encountered difficulties in sourcing shoes locally and decided to import shoes from outside the country. Sy became involved in the banking industry when he acquired Acme Savings Bank (later renamed Banco de Oro or BDO) in 1967. In November 1972, he opened SM Quiapo, SM's first stand alone department store, and entrusted his 22-year-old daughter Teresita to run the store. On November 8, 1985, he established his first SM Supermall, SM City North EDSA. In the early 1990s, SM started opening more shopping malls with the setting up of two malls in Metro Manila and a solitary mall in Cebu City. SM Prime Holdings was incorporated in 1994 and went public. Sy was named "Richest Man of the Year" by the Makati Business Club in 1999 and was conferred an Honorary Doctorate in Business Management by De La Salle University in January of that year. He and his wife established the SM Foundation Inc., which helps underprivileged youths, the disabled and the elderly. He established business presence in Mainland China when the SM Group opened its first shopping mall in his native Xiamen. Other malls were later set up in other parts of Southern China. In August 2005, Sy's stake in the San Miguel Corporation, Southeast Asia's largest food and beverage conglomerate, reached 11%. He sold that stake in October 2007 for $680 million. Sy's holding company, SM Investments (also known as SM Group), has been frequently named as one of the best managed companies in the Philippines. SM Investments is the operator of Banco de Oro (BDO) and owner of Chinabank. In 2006, Sy bought the remaining 66% of Equitable PCI Bank, the Philippines' third largest lender, and merged it into BDO the following year. The transaction turned BDO into the second largest financial company in the country. He was the Philippines' richest man, gaining $5 billion in 2010, amid the global financial crisis. The huge gain was due to his holding company, SM Investments, which has interests in BDO, inter alia. For 11 straight years until his death in 2019, Forbes ranked him as the richest person in the Philippines, with an estimated net worth of US$ 19 billion in 2019. In 2017, Sy stepped down as chairman of SM Investments Corporation and was given the honorary title of Chairman Emeritus as recognition for being the founder of the SM Group. Jose Sio succeeded Sy as chairman. Sy was married to Felicidad Tan, who was a shoelace vendor. The couple had six children: Teresita, Elizabeth, Henry Jr., Hans, Herbert, and Harley. Teresita and Henry Jr. are vice chairpersons of SM Investments, serving under chairman Jose Sio, a longtime lieutenant of Henry Sr. Harley serves as executive director of SM. Sy died in his sleep at age 94. His body was discovered on the morning of January 19, 2019 in his home in Forbes Park, Makati. The interment took place at the Heritage Memorial Park in Taguig, on January 24, 2019. ^ "Board of Directors". SM Investments Corporation webpage. Retrieved June 15, 2018. ^ "Henry Sy & family". Forbes online. Retrieved August 4, 2017. ^ 王艳芳. "Top 10 richest Chinese in the world - China.org.cn". www.china.org.cn. Retrieved September 7, 2018. ^ a b c d Biographical Dictionary of New Chinese Entrepreneurs and Business Leaders. Edward Elgar Publishing. 2009. pp. 160–161. ISBN 1848449518. Retrieved January 25, 2019. ^ a b c d Olsen, Robert (January 19, 2019). "Philippines' Richest Man, Henry Sy, Dies At 94". Forbes. Retrieved January 21, 2019. ^ a b c d e f Gutierrez, Jason (January 20, 2019). "Henry Sy, 94, Dies; Philippines' Richest Man and a Shopping Mall Tycoon". New York Times. Associated Press. Retrieved January 25, 2019. ^ a b de la Cruz, Mio (January 11, 2009). "Stepping Up to the Big Time". Philippine Daily Inquirer. Archived from the original on March 30, 2013. Retrieved January 11, 2012. ^ Bignotia, Carmela (March 10, 2007). "Henry Sy Sr.: The Man Truly Has It All". Retrieved October 16, 2007. ^ a b c d e f Chua, Paolo (June 2, 2018). "How SM's Henry Sy Started with Ten Centavos and Became Southeast Asia's Richest Man". Town & Country. Retrieved January 25, 2019. ^ Philippines mall mogul rakes it in as crisis hits rich: Forbes Archived May 20, 2011, at the Wayback Machine. AFP October 15, 2008. ^ The mall that started it all: Celebrating 25 years of SM City North EDSA by Wilson Lee Flores – The Philippine Star » Lifestyle Features » Sunday Life[dead link]. Philstar.com. August 15, 2010. Retrieved on January 11, 2012. ^ a b c d "Henry Sy stays in Forbes' top 100". The Manila Times. March 4, 2014. Retrieved January 21, 2019. ^ "SM's Henry Sy hikes stake in SMC to 11%". Philstar Global. August 13, 2005. ^ "(UPDATE 2) Henry Sy son in P45-B Meralco stake bid". ABS CBN News. October 30, 2009. ^ Austria, Jennifer (April 26, 2018). "Henry Sy steps down as chairman of SMIC". Manila Standard. Retrieved September 7, 2018. ^ Gavilan, Jodesz (January 19, 2019). "FAST FACTS: Remembering Henry Sy Sr". Rappler. Retrieved January 20, 2019. ^ "Philippines' richest man Sy dies at 94". Yahoo! Philippines. Retrieved January 19, 2019. ^ Lopez, Tony (January 23, 2019). "The dream maker". Manila Standard. Retrieved January 25, 2019. ^ Adel, Rosette (January 24, 2019). "Henry Sy Sr. laid to rest in Taguig City". The Philippine Star. Retrieved January 24, 2019.